I've written on this topic before, but I want to write again following a meeting last night arranged in Cambridge by the Faraday Institute. It was their annual reception and the first time I have taken part in a meeting. I plan to go to some of the public lectures as well. discussion about science and religion. It has an interdisciplinary, academic research program, but it also offers courses, lectures, seminars and conferences. Much of the material is online, available free of charge. Last night's meeting began with something to eat and drink and a chance to circulate and chat. Then we heard Sir Colin John Humphreys, a physicist and Director of Research at Cambridge University, speaking on aspects of life as both a scientist and a Christian. He reminded us that it's important to read the Bible and pray. Finally we had group discussions. Groups had been chosen so that people with similar scientific interests were gathered together. so my group was broadly biological. The discussion was very helpful. We talked about the questions that people ask us, we discussed how to approach conversations rationally and non-confrontationally (being confrontational is a particular weakness of mine). And we considered the difficulties of a busy career in science and finding time for Christian actvities in the midst of it all. I was able to point out the dangers of dualism in our lives and how it's not about the proportion of our time that we spend on this activity or that, but whether we are kind to the person working beside us. In other words, do we reveal the fruit of the Spirit in every part of life; Christian ways of being and living should fill all that we do. We heard about the opportunities the Faraday Institute has in British schools, answering questions that most concern young people. Our group's moderator was Lizzie Coyle who is the Institute's Youth and Schools Outreach Officer; she told us that the commonest questions she hears include 'Why is there so much suffering in the world', and the usual questions about evolution. It was a great evening and I met some really good people. 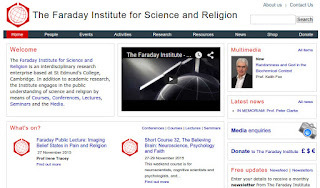 I would like to revisit the work of the Faraday Institute again on this blog; perhaps next time I can introduce some of the good thinking from lectures and seminars. This work is licensed under a Creative Commons Attribution-ShareAlike 3.0 Unported License. A link to the relevant article on this site is sufficient attribution. If you print the material please include the URL. Thanks! Click through photos for larger versions. Images from Wikimedia Commons will then display the original copyright information. Since 18th July 2016, I've been putting my posts on a fresh, new site.